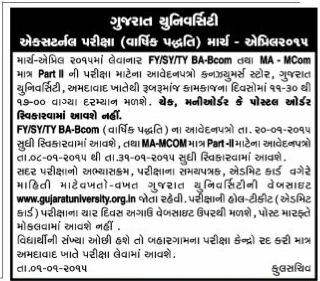 Gujarat University Dhwara March-April 2015 Ma Levanar FY/SY/TY BA-Bcom Tatha MA-Mcom Part-2 Ni Exam Matena Application Form Gujarat University Khatethi Rubruma Kamkajna Divaso Ma 11.30 AM to 5.00 PM Darmiyan Malshe. More Details Like Syllabus, Time Table and Admit Card will be availabel on official website www.gujaratuniversity.org.in. So Candidate are requred to keep visit this page for next updates. Note: Students Number Ochha Hashe to Other Exam Center Cancel Kari Ahmedabad Khate J Exam Levashe.